The movie marquee appearing in The Artist stands on the Warner Bros. backlot. Set in Hollywood during 1927 to 1932, The Artist depicts the romance between a fading silent film star and a rising “talkie” ingénue. The Artist has received glowing reviews and numerous awards, and is noteworthy for being presented in black & white, and without spoken dialog. What’s more, the lead actors, the writer/director, and most of the crew are all French, who traveled to Los Angeles to film the movie at authentic Hollywood studios and locations. While the Los Angeles Times beat me with news of several locales appearing in the film, I’ve gleaned a few locations the Times did not cover, including a connection to Charlie Chaplin, below. The ingénue character Peppy Miller, played by Bérénice Bejo, skyrockets to wealth and fame, and soon sets up house in a fabulous mansion, located at 56 Fremont Place. The palatial home was occupied for a time in 1918-1919 by America’s Sweetheart, silent film superstar Mary Pickford. Pickford was one of the most savvy business-persons in Hollywood, co-founding United Artists in 1919 with her future husband Douglas Fairbanks, and fellow partners Charlie Chaplin and director D. W. Griffith. 56 Fremont Place was home to Mary Pickford from August 1918 to August 1919. It appears in the background from this scene (above left) appearing in Charlie Chaplin's The Kid, and as the home of Peppy Miller in The Artist (above right). The box marks the same corner of the house in each image. Charlie Chaplin no doubt visited Mary at her home at 56 Fremont Place in 1919, and was thus already familiar with the neighborhood when he used it to stage an important early scene from his 1921 masterpiece The Kid, named one of the 2011 entries into the National Film Registry of the Library of Congress. 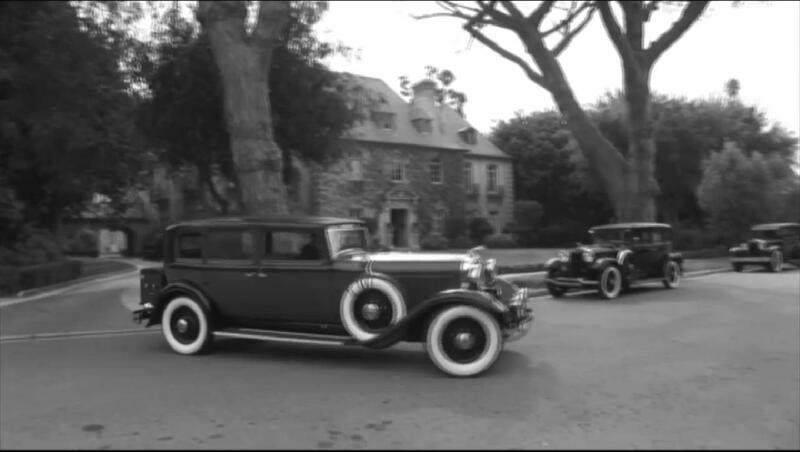 During this scene, an unwed mother played by Edna Purviance abandons her infant son in the backseat of a limousine parked in front of 55 Fremont Place, the home directly across the street from Mary’s home. Thieves steal the car before Edna can return to reclaim her child. Upon discovering the baby, the thieves leave him in the gutter, where Charlie finds him, and raises the kid as his own. 55 Fremont Place, as it appears in Charlie Chaplin's The Kid. This beautiful home was recently owned by prize-fighting legend Muhammad Ali, and stands directly across the street from 56 Fremont Place, the former Mary Pickford home appearing in The Artist. Edna Purviance in The Kid at 55 Fremont Place. George Valentin's mansion at 104 Fremont Place. In 1927 the trees in front of the home would have been much smaller. French actor Jean Dujardin plays George Valentin, the male lead in The Artist, a charming, swash-buckling movie star character fashioned after Douglas Fairbanks. Actual footage of Fairbanks performing stunts from his 1920 landmark film The Mark of Zorro appears in The Artist during a montage of scenes supposedly played by George. The mansion where George lives is located at 104 Fremont Place (above, and marked in the photo below), behind the home Chaplin used when filming The Kid. 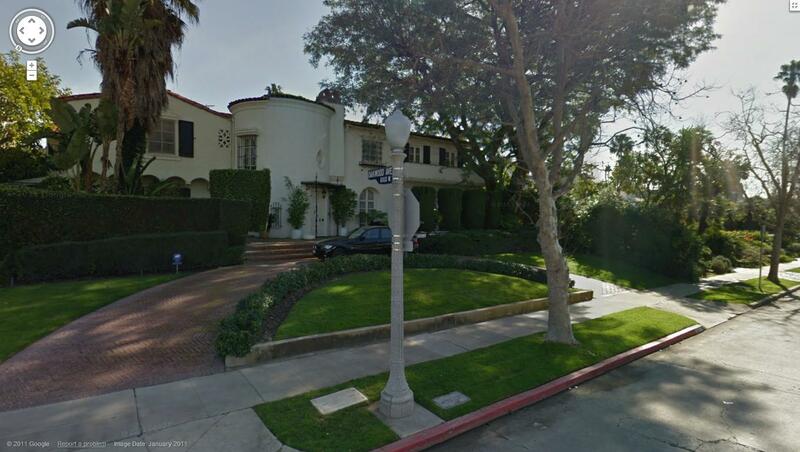 George Valentin's home in The Artist was located at 104 Fremont Place (left box), behind the home Chaplin used in The Kid (oval), itself across the street from the Mary Pickford - Peppy Miller home (right box) beyond the bottom edge of this photo. California Historical Society, Title Insurance and Trust Photo Collection, Department of Special Collections, University of Southern California. One of the greatest challenges when attempting to recreate vintage Los Angeles today is the mature landscaping. Back in the 1920s all of the subdivisions were new, and most homes had no trees to block the view. This aerial view below shows how Fremont Place would more likely have looked during the era depicted in The Artist. Click to enlarge. The oval marks the section of Fremont Place where The Kid and The Artist were filmed. 104 Fremont Place, appearing as George's home, was not yet built at the time this photo was taken. It appears as the vacant lot within the left edge of the oval. 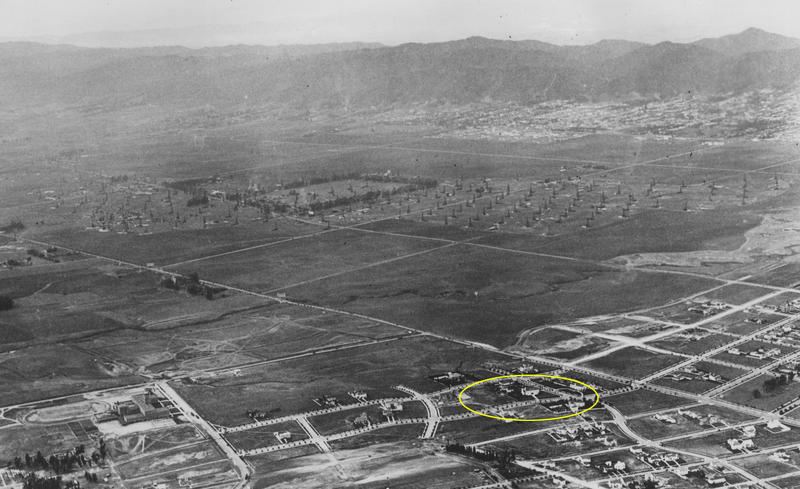 The Kid mansion stands near the center of the oval, while the Mary Pickford - Peppy Miller home is near the lower right edge of the oval. The long diagonal line just above the oval is Wilshire Boulevard, the next major street several blocks above Wilshire is 3rd Street. Security Pacific National Bank Photograph Collection/Los Angeles Public Library. (c) 2011 Microsoft Corporation, Pictometry Bird's Eye (c) 2010 Pictometry International Corp. There is also a scene in the movie where Uggie the dog summons a policeman on the street for help. The corner street sign reading “OAKWOOD AVE, 6100 W” appears in the shot, placing the scene at the corner of N. June Street and Oakwood, below. Check out Part 3 of this series for connections to Harold Lloyd’s Safety Last!, and Part 4 for connections to the Bradbury Building and Bradbury Mansion, and Part 5 for connections to Charlie Chaplin’s City Lights. For more photos and location information about Chaplin filming The Kid visit this PowerPoint presentation on my blog, and my book Silent Traces. And as I mentioned, the LA Times story has a number of locations worth exploring. Thanks also to Carol Kiefer, the Art Department Coordinator who worked on The Artist, for assistance with this post. She reports that the Bugatti driving scene was filmed at the Big Sky Movie Ranch in Simi Valley (which has a landing airstrip), the torture laboratory and cells were filmed at the Eagle Rock Substation, Zimmer’s office, the secretary’s office, the store room, and the auction house were all filmed at the Wilshire Ebell Theater, and that the hospital was the American Film Institute building. The Tears of Love theater interior was the Los Angeles Theater at 630 S. Broadway. UPDATE – Lindsay Blake’s ImNotAStalker.Com has several posts with even more locations from The Artist; including George’s duplex apartment; the history of the Red Studios where much of The Artist was filmed; and of the AFI “hospital” and the Wilshire Ebell where many interior scenes were filmed. PS – The Wilshire Ebell Theater, a 743 Lucerne Boulevard, is also just steps away from the Mary Pickford home on Fremont Place. The Artist (C) La Petite Reine, The Weinstein Company. All images from Chaplin films made from 1918 onwards, copyright © Roy Export Company Establishment. CHARLES CHAPLIN, CHAPLIN, and the LITTLE TRAMP, photographs from and the names of Mr. Chaplin’s films are trademarks and/or service marks of Bubbles Incorporated SA and/or Roy Export Company Establishment. Used with permission. This entry was posted in Buster Keaton, Charlie Chaplin, One Week, The Artist, The Kid and tagged Buster Keaton, Charlie Chaplin, Douglas Fairbanks, Mary Pickford, One Week, Silent Comedians, Silent Movie Locations, Silent Movies, The Artist, the artist filming locations, The Artist locations, then and now. Bookmark the permalink. I just saw the film. What a wonderful movie. This is a great guide to the locations. Thanks for putting it together. The house at the corner of June and Oakwood was once the home of actor Paul Muni according to a recent article I ran across. Pingback: Silent ‘Artist’-ry « Carole & Co.
What a wonderful job! I love things like this, and I went to see The Artist a second time, just to spot the locations where they filmed. I love the filmmakers’ celebration of classic film and classic Hollywood. The irony of it is, that had it been an American studio making the film and not a French one, they would have faked all the locations in Vancouver. Thank you. I had not thought about it, but you make a great point. An American crew would likely have filmed in Vancouver. The Artist was the only Best Picture nominee filmed entirely in Los Angeles. Thank you, thank you for all your painstaking research. Quite fascinating. Thanks Donna – I have tours posted on my blog for your next trip to LA.